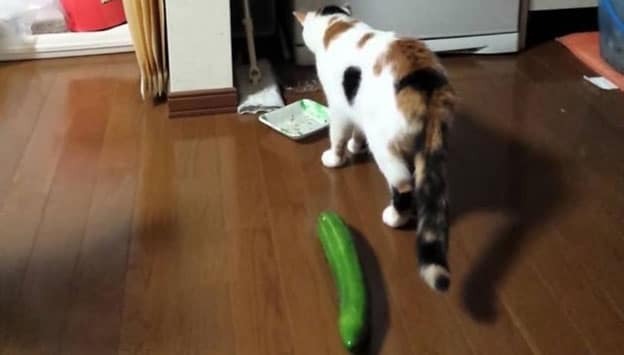 Home Cat Behaviour Why Are Cats Afraid Of Green Cucumber? They say cats have 9 lives and if this is true, then people who scare this fury little creatures might take away more than one life. Viral photos and videos have been circulating the internet about cats turned into somewhat a circus among others. Over and over people are putting the cats into a prank scare. What they usually do? 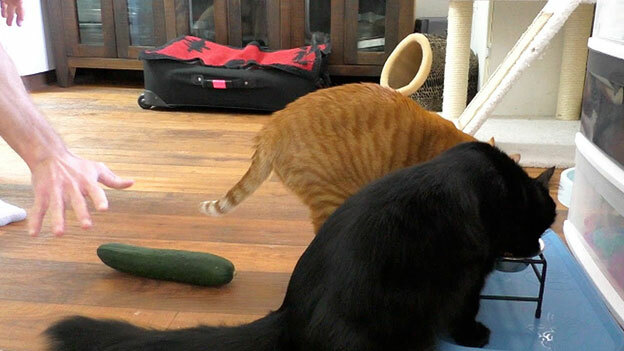 They put a known vegetable salad ingredient, cucumber behind the cat while eating or napping. Once the cat turns around, they get a whole lot of scared! 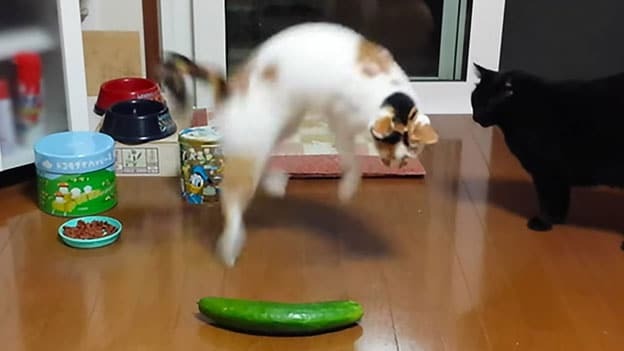 According to veterinarians, the cat’s scary and frightening reactions over a piece of cucumber are not truly because of the vegetable. The real reason why these cats jump into the air, run over and around is the fact due to the surprise element of seeing an unexpected thing placed near their territory without being notice at all. 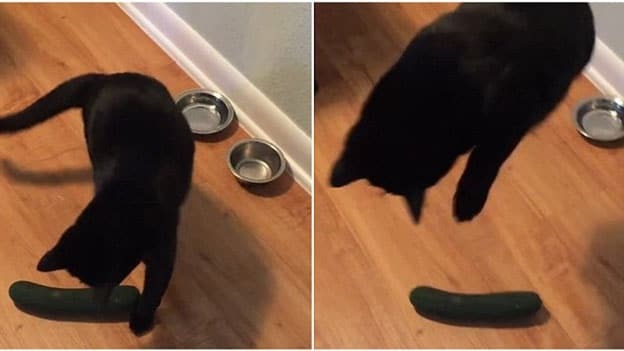 Experts also added that it’s not the cucumber that scares them away it’s actually the thing they encounter the moment they turn their head around. 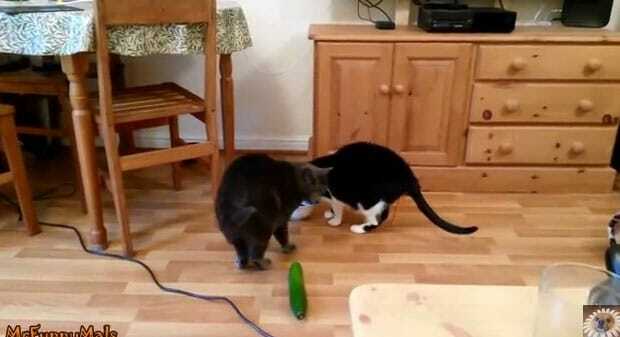 Any object that s replaced with the cucumber will yield the same scary result to the cats. 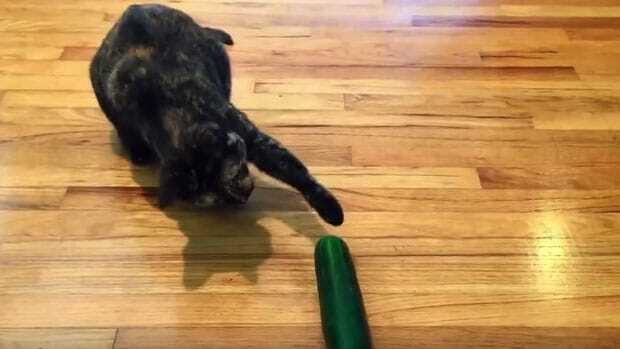 Moreover, another theory which experts believed with that of cucumber is the fact that the cat might perceived it as a deadly snake or other green predator from the wild. People have been warned not to repeat those prank activities with their pet cats because it can cause severe harm and threat to them. It might look and sound funny while seeing the cat jump over anything but the trauma that it will cause them in the long run will prevent them from living their usual lives. 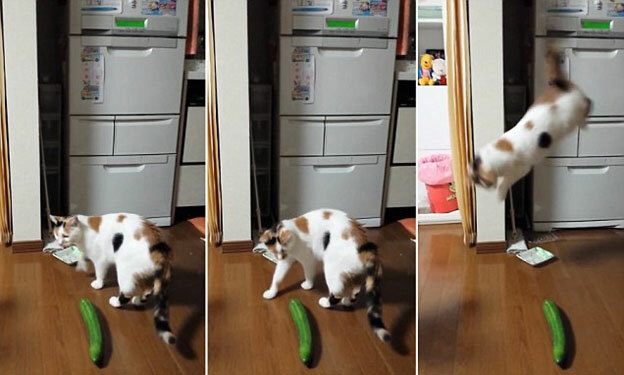 You may think that it’s just a cucumber. But, experts believe that any object near a cat’s food bin can really take a tool on cats because they associate their feeding and relaxing area with close security, safety and happy memories. It is also noted that scaring of cats do not only cause them forceful reactions such as tumbling and tripping over the furniture or other heavy fixture inside the house. It can also lead to some significant psychological effect in the future. Repeated scare and frightening of cats might develop a fear over anything that surrounds them where the prank took place. Remember, your responsibility as a pet owner must take over. Never put your pet into harm just because it looks funny. 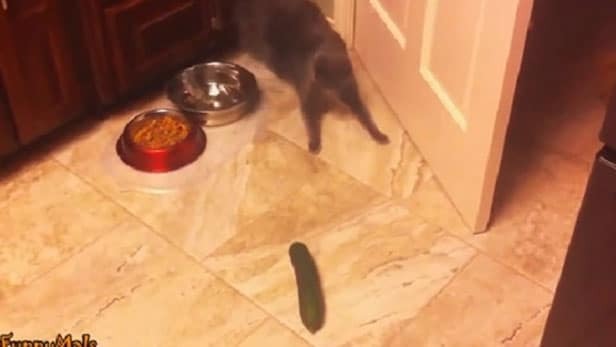 Yes, it may seem funny but the cat’s reaction says it all – very scared! If you’re a cat owner you might want to avoid doing such prank to your pet. Since repetitive startling and frightening experiences among cats can become very stressful and fearful for them. This can cause some serious behavioral problems in the long run. So, be careful on how you play with the cats. Caress them and show that you love and respect them.